Where: Between the right hand side of an off-ramp and the continuing freeway. 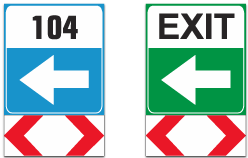 Purpose: To indicate the separation between the off-ramp and the main road. Action: Always pass on the left-hand side of this road traffic sign if you want to leave the freeway and on the right-hand side if you do not want to leave. Where: On the left hand side of the road about 750 m after entering a freeway and after that every 5 to 10 km. Purpose: To confirm that you are on your way to the places as indicated and that these destinations are at the distances indicated. Action: Take note of the destinations and in particular note the distances to plan your trip to fill up with fuel and rest.